We'll bring the coconut, you bring a beach state of mind... 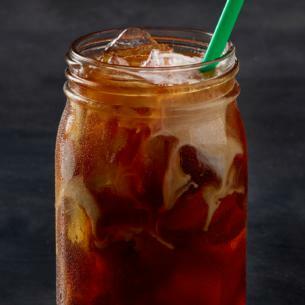 Refreshing and balanced Nariño 70 Cold Brew is sweetened with flavors of toasted coconut and honey, then finished with a float of coconutmilk. Brewed Coffee, Ice, Coconut Milk [Water, Coconut Cream, Cane Sugar, Tricalcium Phosphate, Coconut Water Concentrate, Natural Flavors, Sea Salt, Carrageenan, Gellan Gum, Corn Dextrin, Xanthan Gum, Guar Gum, Vitamin A Palmitate, Vitamin D2 (Ergocalciferol)], Toasted Coconut Syrup [Sugar, Water, Natural Flavors, Citric Acid, Potassium Sorbate].